Kiplinger Today, a "daily digest of timely, trusted advice", regularly lists hundreds of opportune stocks and funds for investors. This Potpourri was collected over the past three months. Kiplinger favorites in small-caps, dividends, monthly payers, and "stocks to count on" sourced this article. 59 select stocks ranged from 0.96% to 11.54% in annual yield and ranged from -8.96% to 35.43% in annual price target upsides per brokers. 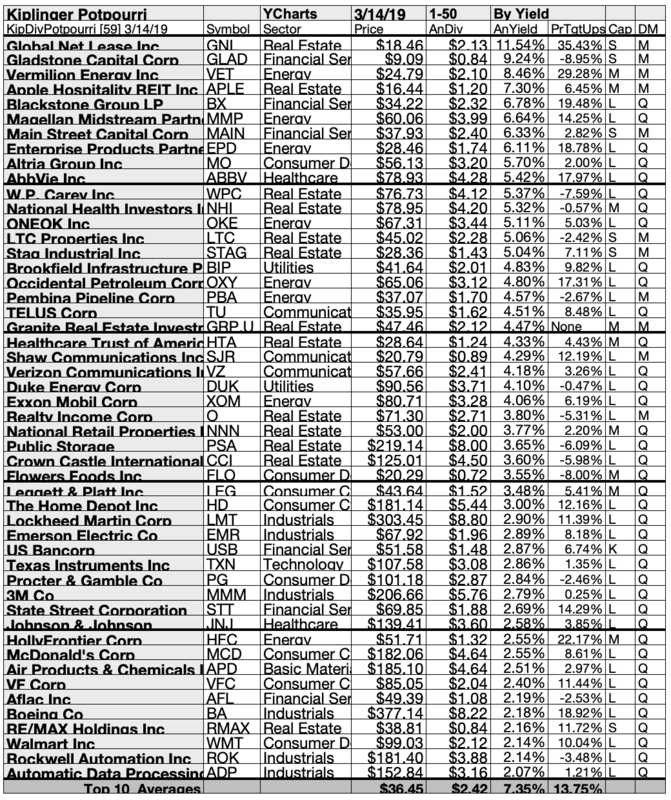 Ten top net gain Kiplinger Potpourri dividend stocks boasted gains from 10.99% to 44.97%. $5k invested in the lowest-priced five March top-yield Kiplinger Potpourri dividend showed 21.08% less net gain than from $5k invested in all 10. Big high-price Kiplinger Potpourri dogs took charge in March. 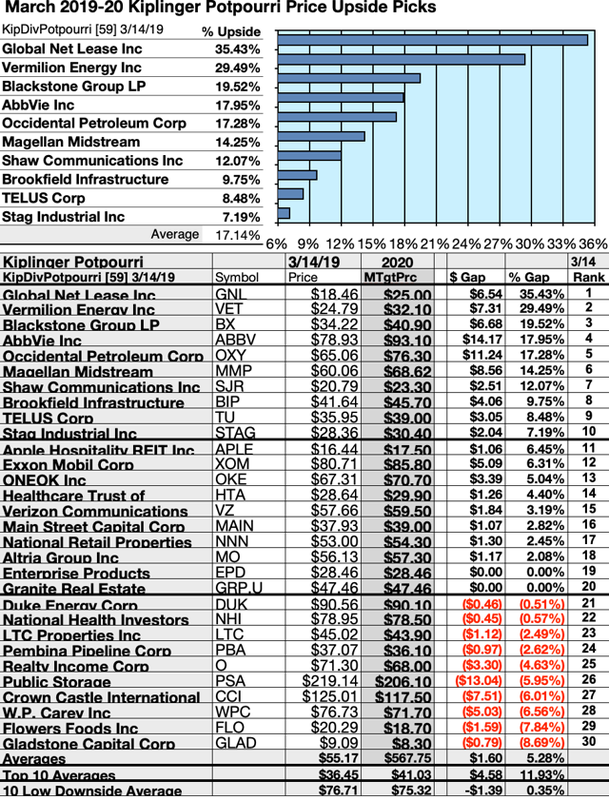 Six of ten top Kiplinger Potpourri dividend stocks by yield were among the top ten gainers for the coming year based on analyst 1-year target prices. (They are tinted gray in the chart below.) Thus, this yield-based forecast for these Potpourri dogs was graded by Wall St. Wizards as 60% accurate. Global Net Lease Inc. (GNL) was projected to net $449.66 based on a median of target price estimate from three analysts, plus dividends less broker fees. The Beta number showed this estimate subject to volatility 30% less than the market as a whole. Vermilion Energy Inc. (VET) was projected to net $359.43 based on a median of target price estimates from fifteen analysts, plus the estimated annual dividend less broker fees. The Beta number showed this estimate subject to volatility 3% more than the market as a whole. Blackstone Group LP (BX) netted $243.00 based on a median estimate from eighteen analysts, plus dividends. The Beta number showed this estimate subject to volatility 43% more than the market as a whole. AbbVie Inc. (ABBV) was projected to net $213.75 based on the median of target estimates from eighteen analysts, plus dividends less broker fees. The Beta number showed this estimate subject to volatility 17% more than the market as a whole. Occidental Petroleum Corp. (OXY) was projected to net $200.72 based on dividends plus the median of target price estimates from five analysts, less broker fees. The Beta number showed this estimate subject to volatility 17% less than the market as a whole. Magellan Midstream Partners (MMP) was projected to net $188.86 based on dividends plus median target price estimates from twenty-one analysts, less broker fees. The Beta number showed this estimate subject to volatility 15% less than the market as a whole. Shaw Communications Inc. (SJR) was projected to net $143.59 based on dividends plus a mean target price estimate from seventeen analysts, less broker fees. The Beta number showed this estimate subject to volatility 12% under the market as a whole. Brookfield Infrastructure Partners LP (BIP) was projected to net $125.77 based on the median of target price estimates from twenty-nine analysts, plus annual dividend less broker fees. The Beta number showed this estimate subject to volatility 41% less than the market as a whole. Apple Hospitality REIT Inc (APLE) was projected to net $117.47, based on dividends, plus a mean target price estimate from six analysts, less broker fees. The Beta number showed this estimate subject to volatility 14% less than the market as a whole. TELUS Corp. (TU) was projected to net $109.94 based on dividends plus a median target estimate from twenty-six brokers, less transaction fees. The Beta number showed this estimate subject to volatility 15% less than the market as a whole. The average net gain in dividend and price was estimated at 21.52% on $10k invested as $1k in each of these 10 stocks. These gain estimates were subject to average volatility 8% less than the market as a whole. W.P. Carey Inc. (WPC) projected a loss of $31.86 based on dividend and a median of the target price estimates from nine analysts including broker fees. The Beta number showed this estimate subject to volatility 40% less than the market as a whole. Public Storage (PSA) projected a loss of $43.00 based on dividend and a median of the target price estimates from sixteen analysts including broker fees. The Beta number showed this estimate subject to volatility 74% less than the market as a whole. Crown Castle International (CCI) projected a loss of $44.08 based on dividend and a median of the target price estimates from nineteen analysts including broker fees. The Beta number showed this estimate subject to volatility 59% less than the market as a whole. Flowers Foods (FLO) projected a loss of $32.88 based on dividend and a median of the target price estimates from six analysts including broker fees. The Beta number showed this estimate subject to volatility 50% less than the market as a whole. The average net loss in dividend and price was estimated at 9.09% on $4k invested as $1k in each of these four stocks. 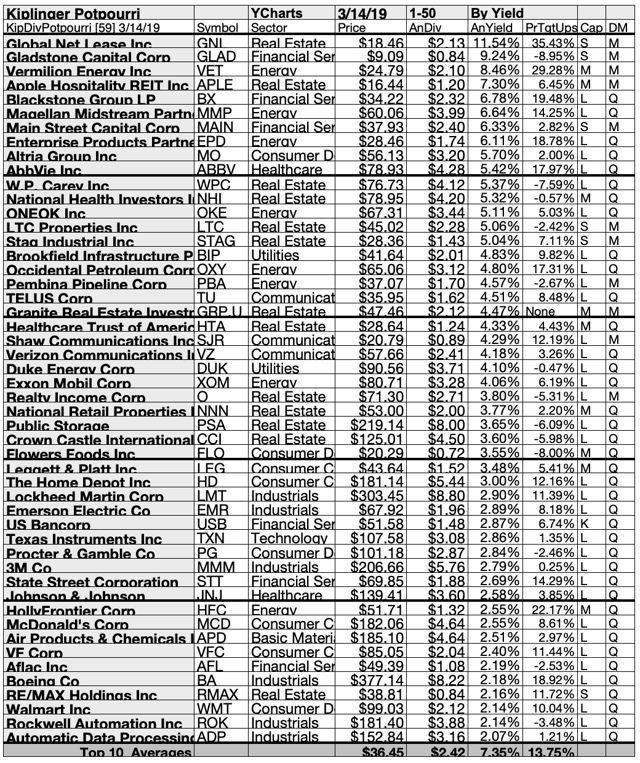 These loss estimates were subject to average volatility 11% less than the market as a whole. Stocks earned the "dog" moniker by exhibiting three traits: (1) paying reliable, repeating dividends, (2) their prices fell to where (3) yield (dividend/price) grew higher than their peers. Thus, the highest-yielding stocks in any collection became known as "dogs". More precisely, these are, in fact, best called "underdogs". Top ten Kiplinger Potpourri stocks selected 3/14/19 by yield represented five of eleven Morningstar sectors. First place was claimed by a the first of two real estate sector representatives, Global Net Lease Inc. . The other real estate representative placed fourth, Apple Hospitality REIT Inc. . In second place was the first of three financial services sector reps, Gladstone Capital Corp. (GLAD) . The other two financial services placed fifth and seventh, Blackstone Group LP  and Main Street Capital Corp. (MAIN) . Three from the energy sector placed third, sixth, and eighth: Vermilion Energy Inc. , Magellan Midstream Partners LP , and Enterprise Products Partners LP (EPD) , respectively. One consumer defensive pup claimed ninth place, Altria Group Inc. (MO) . A lone healthcare representative placed tenth, AbbVie Inc. , to complete the Kiplinger Potpourri top ten by yield for March. Actionable Conclusions: (25-34) Top 10 Kiplinger Potpourri Dogs Showed 7.19% To 35.43% Upsides To March 2020; (35) 10 Lowly Downsiders Ranged -0.51% To -8.89%. To quantify top dog rankings, analyst mean price target estimates provide a "market sentiment" gauge of upside potential. Added to the simple high-yield metrics, analyst mean price target estimates became another tool to dig out bargains. Ten top Kiplinger Potpourri dividend dogs were culled by yield for this update. 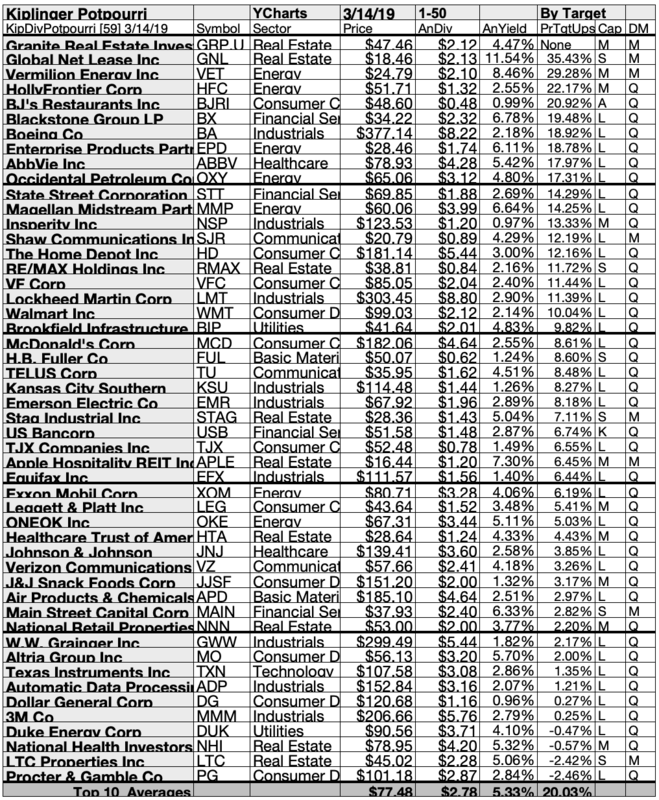 Yield (dividend / price) results verified by YCharts did the ranking. As noted above, top 10 Kiplinger Potpourri dividend dogs selected as of 3/14/19 showing the highest dividend yields represented five of eleven in the Morningstar sector scheme. $5000 invested as $1k in each of the 5 lowest-priced stocks in the top 10 Dividend S&P 500 kennel by yield were predicted by analyst 1-year targets to deliver 21.08% less gain than $5,000 invested as $.5k in all 10. The fourth-lowest priced selection, Vermilion Energy Inc., was projected to deliver the best net gain of 44.97%. 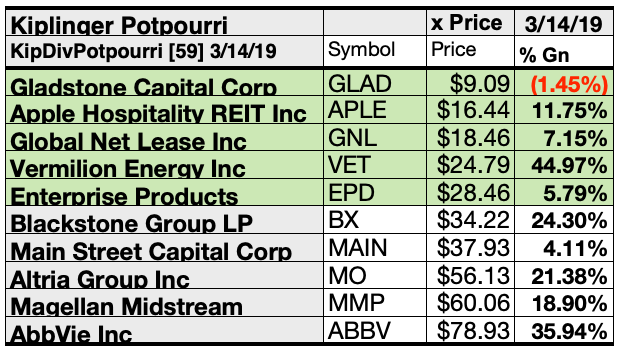 The five lowest-priced top-yield Kiplinger Potpourri dividend dogs for March 14 were Gladstone Capital Corp., Apple Hospitality REIT Inc., Global Net Lease Inc., Vermilion Energy Inc., and Enterprise Products Partners LP, with prices ranging from $9.09 to $78.93. Five higher-priced Kiplinger Potpourri dividend dogs for March 14 were Blackstone Group LP, Main Street Capital Corp., Altria Group Inc., Magellan Midstream Partners LP, and AbbVie Inc., whose prices ranged from $34.22 to $78.93. 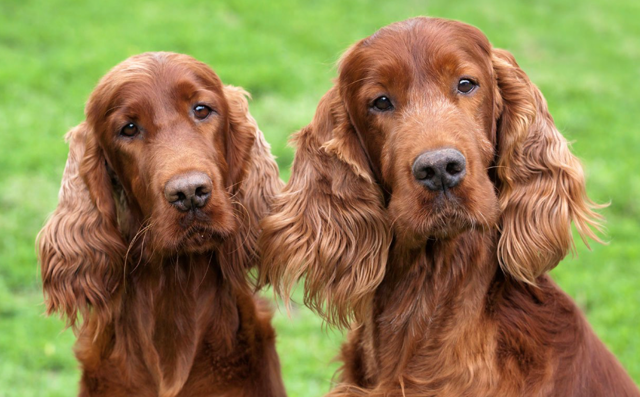 The distinction between 5 low-priced dividend dogs and the general field of 10 reflected Michael B. O'Higgins' "basic method" for beating the Dow. The scale of projected gains based on analyst targets added a unique element of "market sentiment" gauging upside potential. It provided a here-and-now equivalent of waiting a year to find out what might happen in the market. Caution is advised, since analysts are historically only 20-80% accurate on the direction of change and just 0-20% accurate on the degree of change. Click here to subscribe to The Dividend Dogcatcher. Get more information, the follow-up to this article, and a free two week trial. Disclosure: I am/we are long TJX. I wrote this article myself, and it expresses my own opinions. I am not receiving compensation for it (other than from Seeking Alpha). I have no business relationship with any company whose stock is mentioned in this article.